​Seeking compensation for goods lost to the British in 1759, Governor-General Pierre de Rigaud, marquis de Vaudreuil-Cavagnial, recorded what was perhaps the grandest assemblage of porcelain in New France: two complete porcelain services and fifty-dozen porcelain plates. Placed in the vaulted cellar of the château Saint-Louis in Québec, these goods were presumably stolen or destroyed following the British bombardment, despite Vaudreuil-Cavagnial's attempts to retrieve them in 1760. Many elite households in New France and the Antilles boasted Asian and European porcelain for dining, drinking, and decoration. Because true hard paste porcelain was not made in France until the 1750s, nothing surpassed translucent and exotic Asian porcelain for most of the colonial period. 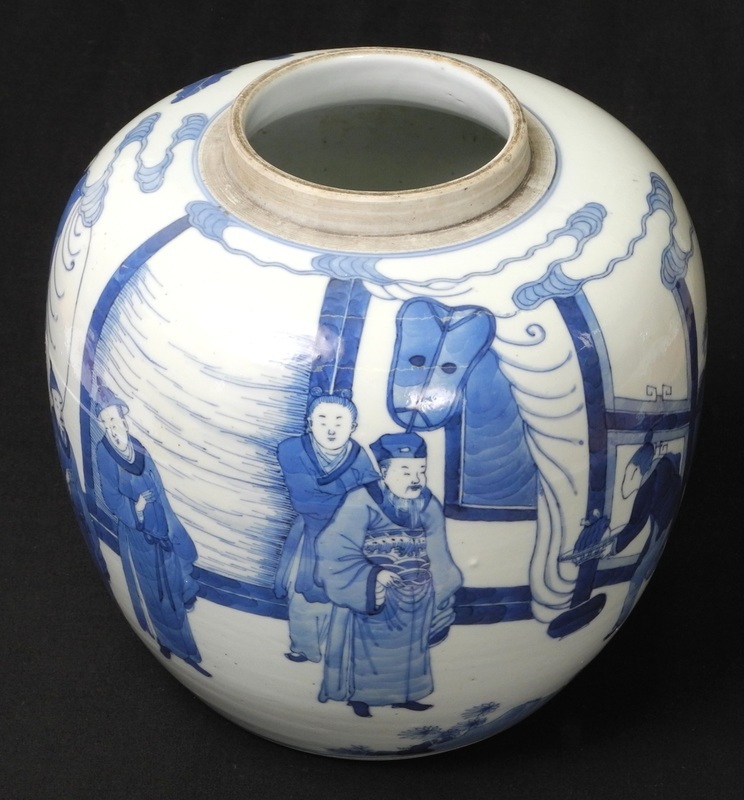 Wares made in the southeastern Chinese town of Jingdezhen were exported in great numbers via the French Company of the Indies in addition to inter-imperial trade. Among the earliest and most surprising instances of porcelain consumption was at Old Mobile, the first capital of Louisiana. Occupied from 1702 until its relocation to present-day Mobile, Alabama, in 1711, the site of Old Mobile has revealed sherds from approximately forty-four distinct Chinese porcelain vessels. Ranging from cups to small dishes and plates, these were likely obtained from inter-colonial trade between the French and Spanish at the Mexican port of Veracruz. The cups below point to the consumption of hot beverages, whether tea, coffee, or chocolate. 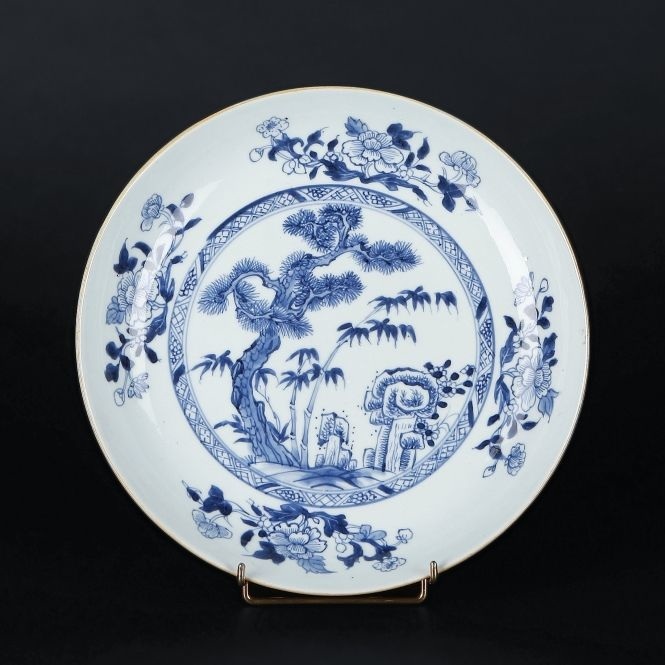 ​Perhaps the governor-general's plates resembled those now in the collection of the Sayward-Wheeler House in York Harbor, Maine; family tradition holds that the Chinese Imari style plate at left and others from a larger set of nine were plundered from a home in the fortress of Louisbourg, possibly that of a merchant or officer, by Jonathan Sayward in 1745. Such plates might have been used together with larger group of serving pieces like an Imari bowl- which could easily have stood in the saladiers or salad bowls frequently recorded in French colonial inventories- or the platter seen below and excavated in Québec. In comparison to Vaudreuil-Cavagnal's staggering fifty-dozen, the 1764 inventory of Pierre Tiphaine, a royal notary in Martinique, lists three-dozen porcelain plates at his home in the port of Saint-Pierre. Jean-Jacques Blaise d'Abbadie made use of six-dozen during his tenure as director-general of Louisiana from 1763 to 1765. Used for elegant banquets and festivities at the château Saint-Louis, it is unclear whether Vaudreuil-Cavagnal's porcelain was Asian or European. However, the former governor-general's collection of "Saxon porcelain figures" was almost certainly produced at the Meissen Factory. These ornamental figures would have adorned the table during a formal meal. ​Some French and European porcelain did make its way across the Atlantic to colonial ports. In 1771, the Saint-Domingue notary Éloi-Michel Grimperel advertised the sale of a "nécéssaire de toilette et de campagne" that included twenty components made of silver, crystal, and Saxon porcelain. As late as 1784, a Monsieur Algrain, director of the postal service of Cap-Français in the colony of Saint-Domingue, advertised a "superb Cabaret of Seve [sic] porcelain, comprised of twelve coffee cups, with their saucers, a teapot, and another vase for cream all decorated with gold." Porcelain made at the royal Sèvres Manufactory just outside Paris represented the height of ceramic luxury in France after its founding in 1756. It is perhaps unsurprising to find traces of it in Saint-Domingue, the wealthiest of France's American colonies. The creole elite of Saint-Domingue was unsurpassed in its tastes for luxury, which extended to imported French furniture, wine, and clothing. 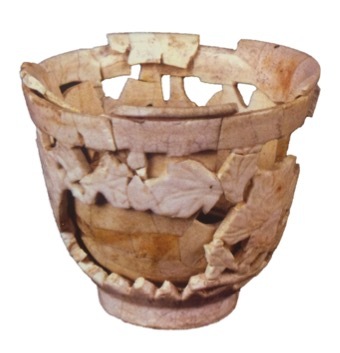 Vaudreuil's inventory also describes three cabarets des Indes used in conjunction with porcelain drinking wares. A cabaret, sometimes referred to as a bandège or bandage, is a sort of tray or plateau of the sort seen in the late seventeenth-century engraving below. The inclusion of Indes, or Indies, in the description of Vaudreuil's cabarets suggests that these were either varnished and decorated in the style of Asian lacquer by European artists or authentic Asian imports. Cabarets figured in the use and display of beverage services. For example, the cabaret of Marie-Anne Lamarque, the widow of Antoine Joseph Fresnel de la Pipardière of Québec, was inventoried together with six faïence saucers and two cups in 1716. In 1724, François Marie Bouat his wife Madeleine Lambert Dumont of Montréal owned one "old" cabaret with four faïence cups and saucers appraised at 3 livres and another seven porcelain cups and six saucers for 20 livres. Philippe de Rigaud's first cabaret came equipped with six of the twenty porcelain cups and their saucers, collectively appraised at 30 livres. A second cabaret was described as "old" and used with a set of six olive wood cups lined with silver; despite its apparent age, this set, along with saucers and a sugar bowl of the same quality and materials, was given a value of 60 livres. A third model described as old and small came with four other porcelain cups and six saucers. This last assortment was worth only 12 livres. 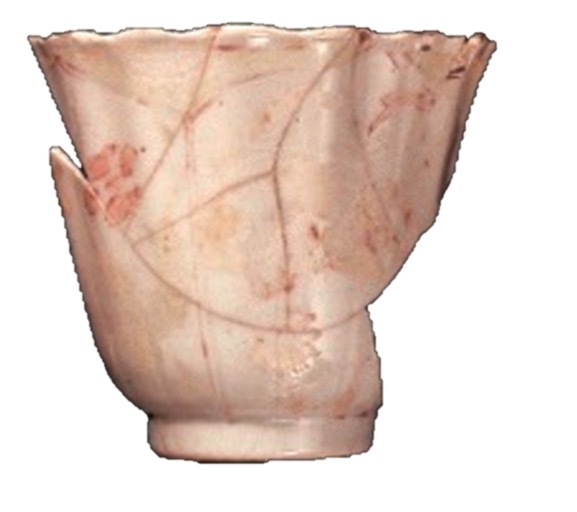 It is possible that the excavated porcelain cup was part of one of these sets. Illustration of a cabaret à café from Nicolas de Blegny's 1687 "Le Bon usage du thé, du caffé et du chocolat"
An elongated, footed gobelet or cup excavated at the site of the château Saint-Louis provides tantalizing clues to the consumption of Chinese porcelain by the governor-general Philippe de Rigaud, marquis de Vaudreuil and father of the aforementioned Vaudreuil-Cavagnial. Measuring 9 cm in height and featuring elegant blue foliage on a white ground, it was discovered in a privy that was sealed in 1719. The edge or lip of the cup is surrounded by a band of alternating diagonal blue lines and a brown rim. Sherds from nearly identical cups have been excavated at Old Mobile and in South Carolina. This extraordinary artifact points to the Vaudreuil household's consumption of porcelain in the first quarter of the eighteenth century. The 1726 inventory of Philippe de Rigaud's effects at the château Saint-Louis mentions two-dozen knives with porcelain handles, one large knife with a porcelain handle, twenty porcelain cups and saucers, three porcelain bowls, three porcelain flowerpots, and one small porcelain pot. The large amount of eating utensils is noteworthy, and their value was enhanced by the addition of porcelain handles. These were likely made in France, perhaps at the Saint-Cloud Manufactory founded to the west of Paris in the 1690s. A 1680s treatise on coffee, tea, and chocolate by Nicolas de Blegny provides one of the earliest illustrations of cabarets and trays used in conjunction with costly ceramics including porcelain. According to Blegny, elites enjoyed coffee using crystal, porcelain, and Delft saucers set upon lacquer cabarets, originally an Asian export. French craftsmen had already begun imitating lacquers by the late seventeenth century, and Blegny noted that they were able to reproduce the original rectangular forms produced in China as well as new round- and octagonal-shaped cabarets. The 1723 edition of Antoine Furetière's Dictionnaire universel relates that the best cabarets were of the sort imported from China and Japan by the French East India Company. These included both lacquered and porcelain trays, which were often embellished with exotic landscapes, figures, pagodas, and houses. Intendant Claude-Thomas Dupuy owned an impressive number of "Chinese" cabarets and equipage for taking hot beverages. These were seized to pay his debts in 1728, along with a gilt stand and one round stand, the latter a European innovation according to Blegny. It appears as though Dupuy subscribed to the fashion for Asian and Asian-inspired décor; notes in his inventory of confiscated goods list gilt wall brackets at the intendant's palace intended for the eventual display of Chinese porcelain, as well as Chinese lacquer chests, a six-panel ebony screen "in the Chinese manner," and Chinese satins. 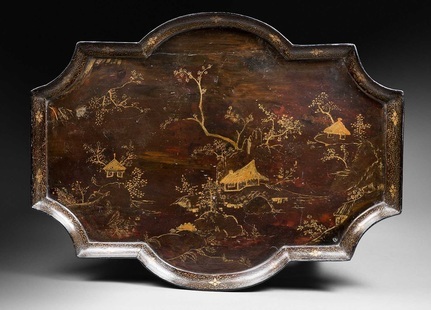 In comparison, the chevalier de Pradel died in Louisiana in 1764 owning "deux petits bandèges de la Chine," a rare reference to lacquered trays in the French colonial Gulf South. ​Cabarets were sometimes inventoried with a base literally described as a pied (foot), meaning that they might take the form of an actual table around which guests could sit. In fact, the term table en cabaret or simply cabaret was often applied to these tables, with French sources sometimes referring to them as tables volantes, or flying tables, given their portable nature. Porcelain and other ceramics might also be set on such tables; the 1765 inventory of Jean-Jacques Blaise d'Abbadie records a porcelain teapot and twelve cups on a small table in New Orleans. 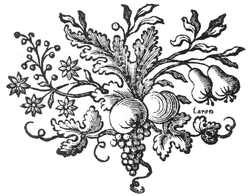 As late as 1781, the inventory of Jean Lacou Dubourg and Marie-Jeanne Isambar of New Orleans describes a walnut cabaret "à pied de biche," indicating a table rather than simply a tray. Such cabaret tables might be equipped with small drawers and can be seen in the paintings of artists such as Alexandre-François Desportes and Jean-Baptiste-Siméon Chardin as well as the portraits in the next section. Dating to the 1750s, these three portraits from Paris and the provinces illustrate the use of porcelain drinking wares in conjunction with various tables en cabaret. The Limousin nobleman Pierre-Grégoire de Roulhac, Marguerite-Urbane Sengstack of Nantes, and an unidentified Parisian mother and daughter could almost be wealthy colonial consumers in urban settlements of Canada, Louisiana, or the West Indies. 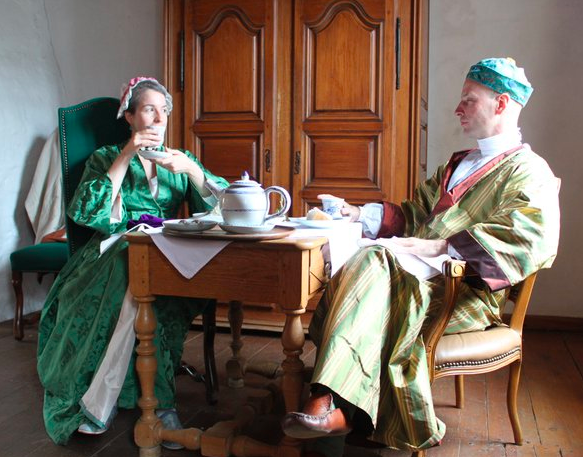 Like these sitters, French colonists of means imbibed fashionable exotic drinks including coffee and chocolate. Both surpassed tea in popularity and required an array of items to be properly served. Jean Chevalier's portrait also showcases the fashion for small, portable tables used as part of beverage service. The table in the painting appears to be lacquered and gilt. The young girl has her hand in a bowl full of a colonial product, sugar, while her mother lifts up an Asian porcelain cup brimming with American chocolate. ​Varying in embellishment and ornamentation, some of the tables seen in the paintings feature rimmed tops that provide protected and waterproof surface upon which to serve hot beverages. Some tables were specifically designed to accommodate the insertion of both ceramic and lacquered trays as tabletops. Looking closely at Roulhac's portrait, the lacquered tray is clearly distinguished from the wooden base but is possibly a permanent fixture. The colorful porcelain seen is likely an Asian import. The lavishly carved table seen in the portrait of Marguerite-Urbane Sengstack at right points to the consumption of the finest sorts of furniture even in the provinces. 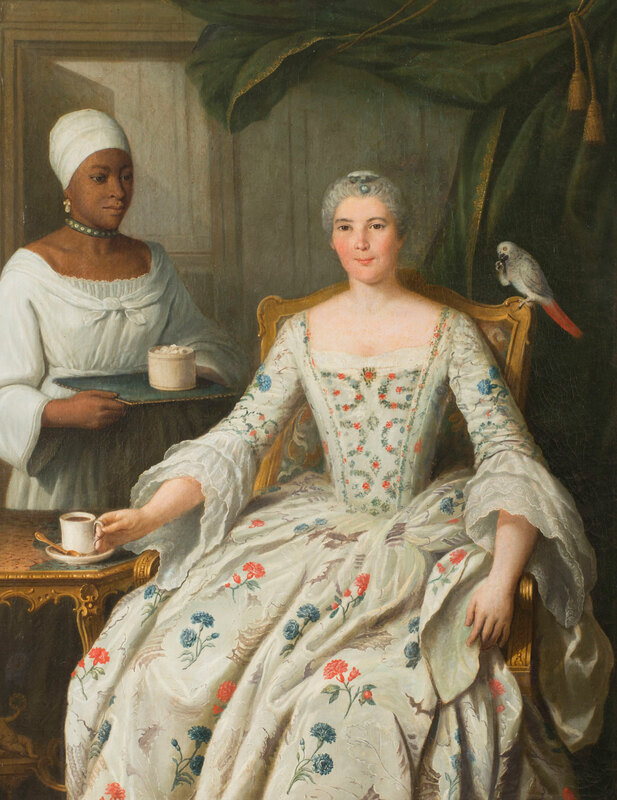 Married to Dominique Deurbroucq, one of the most prominent merchants and ship owners of Nantes, Sengstack is depicted enjoying coffee or chocolate sweetened with another colonial product, sugar, served by an enslaved African attendant. ​With their distinctive hoof-shaped feet, the tables below are representative of the sort of lacquer products made in France but inspired by Asian prototypes. Known as vernis Martin, after the Parisian Martin brothers who perfected the recipe in 1728, the lacquer used to finish these French tables is derived from a mixture of oil, copal tree resin, and turpentine. Some of the small tables inventoried in French colonial households and likely used to serve beverages appear to have been lacquered and imported from the metropole. For example, a "petite table façon de la Chine" owned by Jean-Baptiste Gaillard, king's councilor of the Superior Council of Québec, and his wife Louise de Jordy de Cabanac was inventoried in their chambre in 1743. Further discussion of small tables, including a group of Louisiana tables en cabarets, can be accessed here. 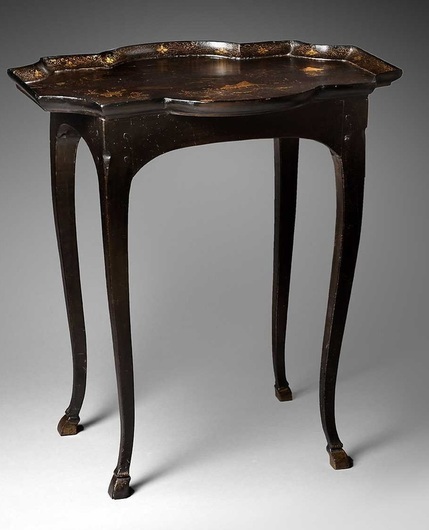 The Louisiana tables speak to the persistence of French design in the colonies. Designed with an eye for convenience and comfort, their portability and small size allowed their owners to move them about as they pleased in the home and possibly outdoors​, perhaps under the galleries commonly built around creole style houses. Encouraging a degree of intimacy and informality, such tables simultaneously set the stage for colonial consumption of luxury goods like Asian export porcelain and exotic beverages. François Martel de Brouague, a noble merchant of Québec, owned a variety of ceramic wares, including porcelain. A discussion of faïence and religious items used in his homes in Labrador and Québec can be found on the faïence and devotion pages. As commandant of Labrador from 1717 until his death in about 1761, Martel de Brouague was charged with protecting French fishing settlements in the North Atlantic. He and his family were living at the Labrador post of Phélypeaux by 1730, when his first wife, Anne-Marie Favry du Ponceau, died there. He made vast profits on fishing and seal hunting in the area, and an inventory of his material effects points to commercial success. ​Brouague's multi-room house in Phélypeaux was filled with costly items including silver, faïence, tapestry, and porcelain. An inventory made before his departure in 1740 reveals the extent of his use of luxury goods in the northernmost reaches of New France, including a porcelain sugar bowl (sucrier) with six cups and saucers. These were included alongside one lacquered cabaret, below which appears a "Testiére," probably a corruption of théière, or teapot. Martel de Brouague's new wife, the colonial-born noblewoman Louise-Madeleine Mariauchaud d'Esgly, might have made use of these objects. At this time it is unclear whether she ever joined her husband in Phélypeaux or preferred to stay in Québec, where she was married and gave birth to her six daughters. Other colonial consumers were not to be outdone in acquiring porcelain. Inventoried in 1745, the estate of François Bissot and Marie Dumont of Québec included four porcelain cups and saucers. ​Appointed governor of the town of Trois-Rivières in 1743, Michel Bégon de La Cour owned a cabaret with five cups and saucers, a teapot, and a slop bowl, "all of porcelain," upon his death in 1748. This set with inventoried in the chambre of his home. The wording of the inventory suggests that the cabaret was also of porcelain. Also inventoried in 1748, the property of Québec merchant Nicolas-Jacquin Philibert and Marie-Anne Guérin included six porcelain teacups and saucers followed by a teapot and faïence bowl. Recovered from a sunken Dutch East India Company ship, the Geldermalsen, the teabowl and saucer seen at right approximate the appearance of such porcelain. This ship was lost in 1752 and rediscovered in the 1980s, when its cargo was salvaged and sold at auction. Although popular imagination has made him out to be a sort of bearded and buckskin-clad frontiersman, Pierre Gaultier de Varennes, seigneur de La Vérendrye, was anything but. Having returned from his westward explorations in 1743, he amassed an extensive wardrobe- his inventory lists silk stockings, a silver watch and snuffbox, a wig, several gold- and silver-trimmed beaverskin hats, and coats with gold and diamond buttons- along with a collection six porcelain cups and saucers, a faïence teapot, pot, and sugar bowl at the time of his death in 1749. François Goudeau, the king's surgeon in New Orleans, owned two porcelain tea services. His property, inventoried in 1759, included one porcelain service composed of a platter, eight porcelain cups and saucers, a teapot, a large bowl (possibly a slop bowl for dregs or grounds), and a plate. The second consisted of ten covered porcelain cups and saucers, two sugar bowls, and two fruit dishes. By the mid-eighteenth century, ceramic trays, including faïence and porcelain models, were used in beverage services along with lacquered cabarets. 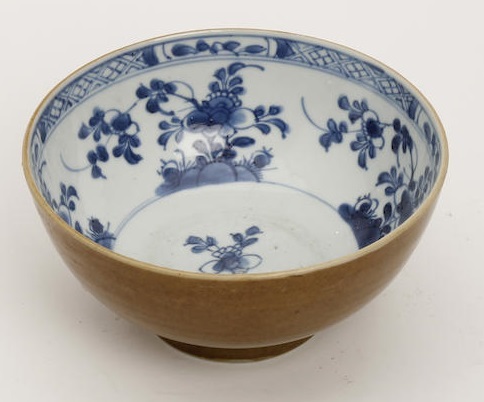 Chinese porcelain has also been recovered from various sites in the Atlantic fortress of Louisbourg, in the colony of Île Royale on Cape Breton Island. The 1754 inventory of Marie-Josèphe Le Borgne de Belle-Isle, a nobly-born Franco-Abenaki businesswoman and widow of Île Royale’s treasurer, records forty-one porcelain plates, a bowl, and two cups appraised at 54 livres altogether. These were certainly reserved for more formal dining, with the rest of the inventoried ceramics including an abundance of faïence and other earthenwares. It easy to imagine her aunt Anne Le Borgne de Belle-Isle and uncle Jean-Baptiste Rodrigue, a merchant-class couple in Louisbourg, enjoying imported coffee using imported ceramics including porcelain. The image below was taken in their reconstructed home within the fortress. Société d'histoire In Memoriam, Fortess of Louisbourg Historic Site. Although archival records are most revealing with respect to porcelain consumption by white colonists, they were not the only ones to own and use imported ceramics and cabarets. The fortunes of free people of color or gens de couleur libres rose over the course of the eighteenth century even if these individuals remained disenfranchised. 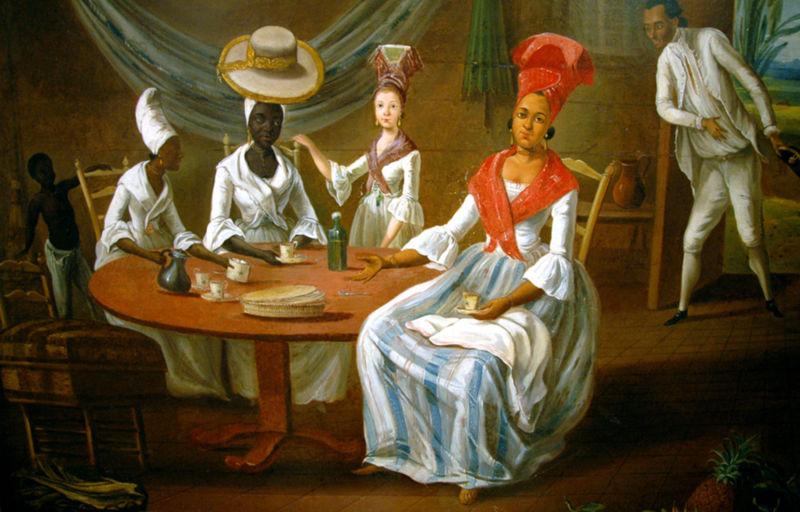 The Martinique-born Saint-Domingue refugee Médéric Moreau de Saint-Méry described the luxuries enjoyed by free people of color, specifically women, in port cities by the 1770s. These included "a mirror, a table, a fine cabaret with porcelain, pretty painted straw or caned chairs." Such finery, he wrote, was ordinarily to be found in rooms designated as salons and which were often wallpapered. The painting at left offers an idea of these interiors and reveals the complicated relationship between material culture and developing notions of French and French Atlantic identity in the eighteenth century. Also referred to as appliques, mountable brackets like those seen here were ideal for the display of porcelain vessels, clocks, and other decorative objects or lighting fixtures including girandoles and candlesticks. Dupuy's consoles were likely of giltwood. Porcelain could also be decorative, like the marquis de Vaudreuil's "Saxon" porcelain table figures. Intendant Claude-Thomas Dupuy owned five pieces of round porcelain in 1728, in addition to as twenty consoles. He described ten of these brackets as "suitable for the display of porcelain" in the intendant's palace. Excepting kitchen implements, these consoles are the only objects whose placement in the palace was recorded. Dupuy described them "in the petit cabinet and elsewhere." By installing wall brackets in the palace, Intendant Dupuy followed tenets of late baroque design from the previous century. Treatises on decoration, like those of the exiled French Huguenot Daniel Marot, advocated for rows of brackets and matching tables and stands, often set on either side of fireplaces. These were in turn used for the display luxury items, specifically porcelain vases, saucers, and other vessels. Although faïence, glass, and even marble vessels appear in inventories as ornamental garnitures, Dupuy's notes are the only records yet known to suggest the use of porcelain in interior decoration in French colonial homes.